Thank you for joining us for the Color Of Love Challenge and we hope you will all join us again this week too. This week we are showcasing Wild Rose Studio Products this week. You don’t have to use them for the challenge but if you have them we would love to see them used. 1. The card base is made of Kraft cardstock. 2. 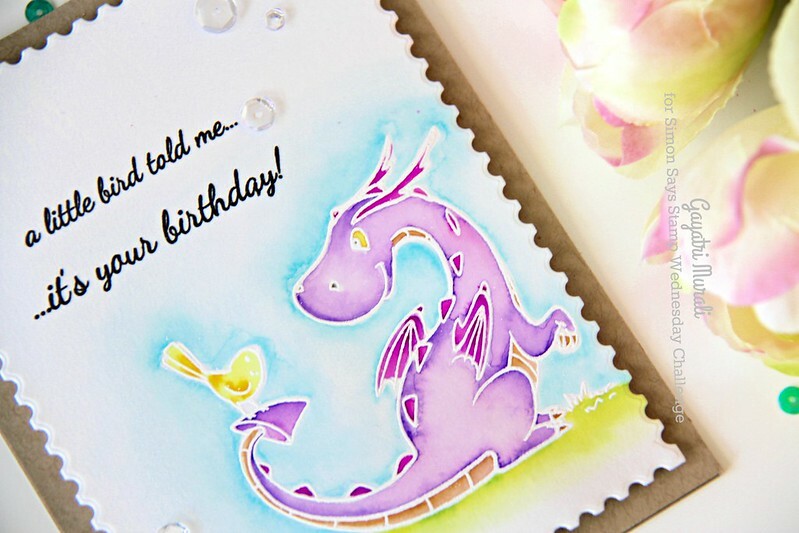 This cute image from Wild Rose Dragon and Bird stamp set is white heat embossed on Bristol cardstock panel. 3. I took inspiration from the package of the stamp set to colour my image. I used Zig clean brush pens and water brush to colour the image. 4. Once dry, I stamped the sentiment in Versafine Onyx Black ink and clear heat embossed the sentiment. 5. To add interest to the panel, I used Simon Says Stamp Postage Stamp Edge Frames die set to die cut the panel. 6. I adhered this panel on the kraft card base using foam adhesive and embellished the card using Sparkly Clear sequins. So now it’s YOUR turn to create something cute and join in! Thanks for stopping by my blog today. I am back soon with another post. Aw this is so sweet, the white embossing really works so well. Such a lovely card. Super cute. Love the fresh and sweet colors. This is too cute, Gayatri! I love how you embossed and colored… such a fun and unique look! 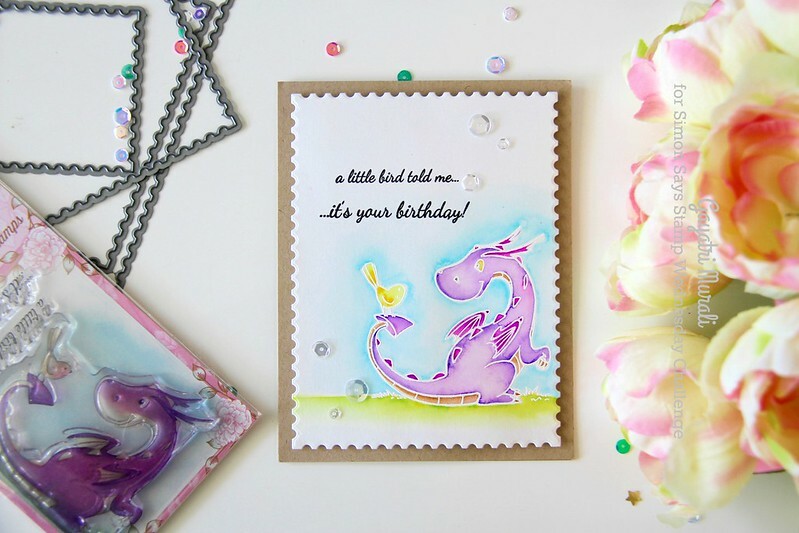 Gayatri, your card is darling – your dragon and the little bird is so charming! Love your design!! 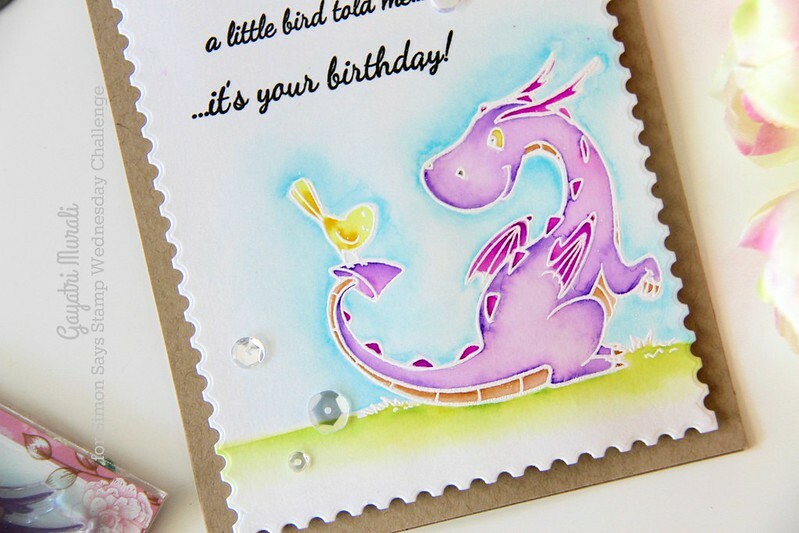 I'm loving the color of your sweet dragon – it looks so much more fun than a green one! Love the postage stamp edges too!